UFC Denver just picked up a pivotal match-up for the flyweight division. 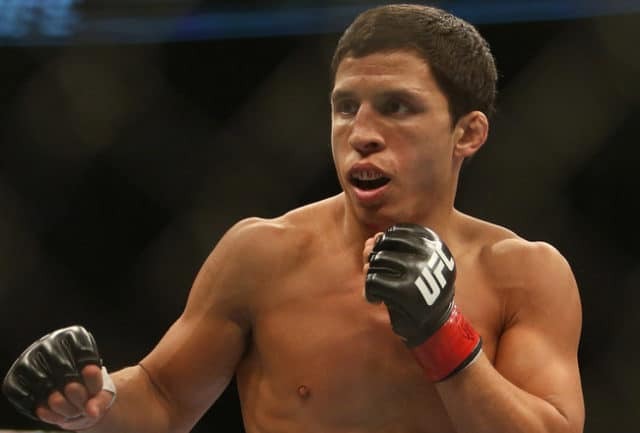 Fresh off Henry Cejudo’s shake-up of the 125-pound weight-class, Joseph Benavidez vs. Ray Borg has been confirmed for the card. The fight was confirmed on Wednesday for the November 10th show that will celebrate the promotion’s 25th anniversary. The Denver Post first reported the news. Both men come into the contest off losses. Benavidez’s six-fight win streak was ended against Sergio Pettis at UFC 225 in June. Pettis bested the former flyweight title challenger via split decision. Borg’s last fight was for the flyweight title, dropping a spectacular fifth round submission to the now-dethroned Demetrious Johnson in October. He was initially expected to return against Brandon Moreno at UFC 223. Unfortunately for him, he was one of the fighters injured by Conor McGregor’s bus attack in Brooklyn. Shards of glass ended up in Borg’s eye and forced him off the card. ESPN reports that Joseph Benavidez vs. Ray Borg was initially planned for UFC 229 on October 6th. 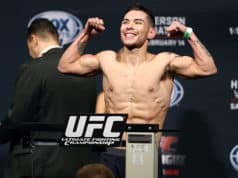 Due to Conor McGregor headlining that card, and an order of protection being filed against the Irishman on behalf of Borg, the fight found its way onto UFC Denver. Despite that fact, the UFC claims the fight was moved for unrelated reasons. UFC Denver takes place from the Pepsi Center in Denver, Colorado on November 10, 2018. The card is headlined by a featherweight fight between Frankie Edgar and “The Korean Zombie” Chan Sung Jung.